Why does the United States Agency for International Development (USAID) promote apparel sourcing from Africa? From the video, how do you see the social and economic impact of the textile and apparel industry on Madagascar and Mauritius? Do we need African Growth and Opportunity Act (AGOA)? Why or why not? With regard to the status of the textile and apparel industry in Madagascar and Mauritius, anything shown in the video interests or surprises you? First, the retail market is gradually recovering. According to AAFA, on average, every American spent $907 on clothing (or purchased 64 garments) in 2013. Although this figure is still less than the one before the 2008 financial crisis, it is the highest level since 2012. Second, “Made in USA” is growing but US consumers still rely on imports. Data from AAFA shows that US apparel production increased 6.2 percent from 2012 to 2013, accounting for 2.55% share of U.S. apparel market. However, nearly 98% of apparel consumed in the US were still imports in 2013. 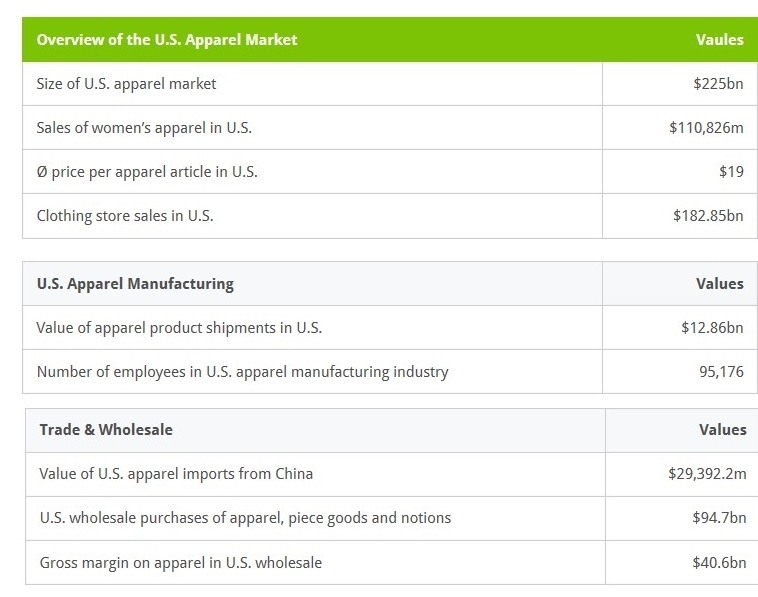 Third, China remains the top apparel supplier to the United States. Despite the concerns about the rising production cost in China, latest data from OTEXA shows that, in 2014 (January to November) China still accounted for 42.5% of US apparel imports in terms of quantity and 39.1% in terms of value–almost the highest level in history. These two numbers were 41.7% and 39.9% a year earlier. On the other hand, Vietnam’s market share has reached 9.3% (by value) and 10.7% (by quantity) in 2014 (January to November), about ¼ of China’s exports to the United States. Fourth, job market reflects continuous shift of the apparel industry. According to AAFA, among the total 2.8 million workers directly employed by the US apparel industry in 2013, only 5% were in the manufacturing sector, 5% were in the wholesaling sector and as many as 90% were working for retailers. However, within the apparel retail sector, total employment by the department stores is quickly shrinking—dropped 7.6 percent from 2012 to 2013 and cumulatively 21.3 percent from 1998 to 2013. At the same time, specialty clothing stores and sporting goods stores are hiring more people: 13.8% and 64.5% increase of employment from 1998 to 2013 respectively. The contrasting employment trend reflects the changing nature of the U.S. apparel retail market and the channels through which U.S. consumers purchase clothing. Fifth, US consumers are paying higher taxes on imported clothing. Calculated by AAFA, while the overall U.S. imports were only charged by a 1.4% tariff rate, the effective duty rate on all apparel imports rose to 13.6% in 2013. The higher effective duty rate may be caused by the fact that less apparel were imported utilizing free trade agreement or trade preference programs. China will remain the dominant supplier, though Vietnam and Asia as a whole are seen as having more growth potential. Companies aren’t leaving Bangladesh, and are committed to compliance. Companies continue to look for opportunities closer to home, including the United States, as they diversify their sourcing. Companies are diversifying their sourcing and expect to continue to do so. However, current FTAs and preference programs remain under-utilized or don’t represent a major component of respondents’ sourcing. Respondents welcome the passage or renewal of all future trade agreements that intend to remove trade barriers and facilitate international trade in the industry. The 2014 USFIA benchmarking study is conducted based on a survey of 29 executives at 29 leading U.S. fashion companies from March to April 2014. The study incorporates a balanced mix of respondents representing various business types in the U.S. fashion industry, including retailers, importers, wholesalers, and manufacturers. The survey asked respondents about the business outlook, sourcing practices, utilization of Free Trade Agreements and preference programs, and views on trade policy. Responsible sourcing: a variety of different themes inclusive of sustainability, compliance, chemical safety and product safety. In the past, the apparel industry has been very reactive in these areas, and efforts have accelerated to move to a more proactive model in 2014. Demand for greater supply chain visibility: a higher level focus and a lot more time will be required to look at the supply chains from end to end, especially for tier 2 and 3 component suppliers. Apparel industry needs to be focused on preparing to be more transparent on what goes into making its products and the carbon and water footprint it leaves behind. There will also be a stronger emphasis on quality, and more intelligence and agility in the supply chain, including how to achieve global flexibility in supply to maximize advantages and benefits offered by different regions. Adjust to the industry “new normal”: speed, efficiency and cost management. ‘Quick response’ or ‘fast fashion’ is no longer a catch phrase, it’s a business reality. Speed is king. Retailers have learned to manage with smaller inventories and to quickly react to consumer needs. Additionally, there are no more low cost countries (with capability and capacity) to tap into, which requires more efficient cost control through supply chain design and management. Internet and omni-channel retailing. The internet continues to upend the apparel industry. Brick and mortar companies are still struggling to figure out how to harness the power of the internet – and struggling to figure out how big of a threat pure-play internet companies are. Meanwhile, the proliferation of internet-only companies continues, increasing the competitive pressure on everyone (including the older internet-only companies!). All of this will end up resulting in a much stronger industry overall – but in the meantime there will be a lot of hand-wringing and heartache. Economic outlook. Overall, 2014 will be a year better off than 2013. The US economy continues to improve, the Eurozone recession has stabilised and there is the huge opportunity Asia offers. Country risk. Whatever happens in the real economy, political tensions throughout developing countries (except possibly China and Vietnam) are growing. They are about more than working conditions in garment factories – and we cannot expect the garment industry to remain immune from them. International market expansion. Global vertical retailers and brands need to balance the efficiency of global assortments with being able to cater to a broad range of consumer purchasing preferences across cultural groups. Winners manage to preserve their brand identity while offering attractive choices to this diverse customer group. Trade policy and trade politics. 2014 is an election year for US Congress. It will only be tougher to find bipartisan consensus. Things to watch include whether the Obama Administration is going to finalize the Trans-Pacific Partnership (TPP) during 2014, whether the Trade Promotion Authority (TPA) can get passed as well as the renewal of the Generalized system of Preferences (GSP) and African Growth and Opportunity Act (AGOA). China’s role in the global apparel supply chain. China’s productivity miracle has been the single major influence on global sourcing over the past five years. While this cannot go on forever it is hard to see a significant change in its share in 2014. China’s dominance of upstream textile production (spinning, weaving and knitting) is under greater threat. Its main operators are making substantial overseas investment, and while the timing of major upstream projects means this will have little impact on fabric and yarn manufacture in 2014, the subject will preoccupy observers. Onshore garment development in Japan, Germany, the UK and US will continue to create much publicity, but limited amounts of garments. Nearshoring continued to lose market share in the EU and US during 2013, though many buyers express growing interest, and there are signs of growth in some categories. It will be surprising if it shows any significant increase in 2014. When Apparel “Made in China” Become More Expensive, Will U.S. Consumers Have to Pay More? China’s soaring labor cost in recent years has triggered heated discussions on the future of “made in China” and its implication for U.S. consumers who rely heavily on “made in China” products (Rein, 2012). This is particularly the case in the U.S. apparel retail market, where over 98% of consumptions are supplied by imports and nearly 40% of them come from China in value (AAFA, 2012). Although numerous studies have been conducted to evaluate the relationship between imports and the U.S. domestic apparel production or employment (Martin, 2007), the direct linkage between the price of imports and the U.S. apparel retail price has seldom been explored. Because such a price linkage is the key to understand the implication of a more expensive “Made in China” for U.S. consumers, this study tries to fulfill the research gap and specifically investigate to which extent the U.S. apparel retail price is influenced by the price of U.S. apparel imports from China. First, for menswear, more expensive “made in China” will result in a higher retail price in the U.S. market. Specifically, the U.S. retail price is suggested to change by 0.137% in the same direction given a 1% change of the price of U.S. imports from China. Second, for womenswear, there is no evidence showing that the price of U.S. imports from China has statistically significant impact on the U.S. retail price Third, the U.S. apparel imports from China and from rest of the world are suggested to constitute higher degree of price elasticity of substitution for womenswear than for menswear. First, the results imply that when “made in China” becomes more expensive, U.S. consumers may not have to pay more, largely because of increased substitution supply from other apparel exporters. Second, the results suggest that the U.S. apparel market is highly competitive and suppliers may not own much market power in price determination despite their large market shares.Third, the results imply that although “made in China” may lose market share in the U.S. market when it becomes more expensive, the magnitude could vary by product categories. Armington, P.S. (1969). A theory of demand for products distinguished by place of production. International Monetary Fund Staff Papers,16(1), 159-178. Martin, M. (2007). U.S. clothing and textile trade with China and the world: Trends since the end of quotas. Congressional Research Services, RL 34106, Washington, D.C.. Rein, S. (2012). The end of cheap China: Economic and cultural trends that will disrupt the world: Wiley. Author Sheng LuPosted on November 17, 2013 July 24, 2016 Categories International Trade, Original Research, RetailTags apparel, China, Sourcing27 Comments on When Apparel “Made in China” Become More Expensive, Will U.S. Consumers Have to Pay More? First, the global apparel sourcing cost is expected to rise modestly in the next 12 months (1.7% increase on average). Labor cost is tagged as the No.1 driving force of the rising sourcing cost. 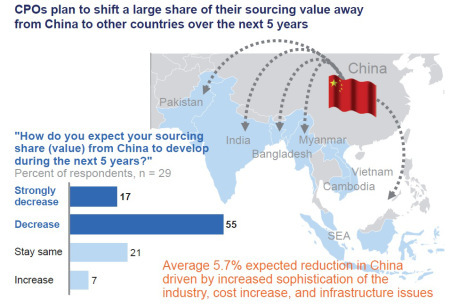 Second, companies are sourcing less apparel from China, but they move in a very cautious way. In the meanwhile, Asia is still seen as the world hub for apparel manufacturing & exports in the years to come. Such a pattern reflects the exact criteria for sourcing decisions: a balance of price, quality, capacity, speed and risk. 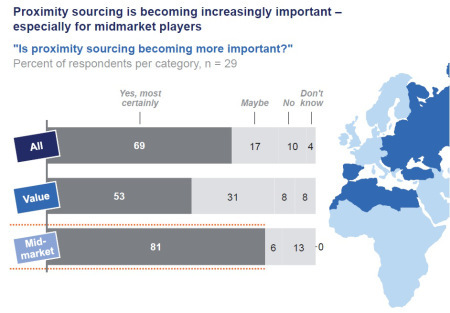 Particularly, “proximity sourcing” is becoming increasingly important according to the surveyed CPOs. This rule shall also apply to China which has emerged as one of the world’s fastest growing apparel retail markets. Third, despite the frequent reported corporate social responsibility problems, a combined consideration of labor cost advantage, free trade agreement benefits and capacity make Bangladesh remain the No. 1 hot pot for apparel sourcing for the next 5 years. 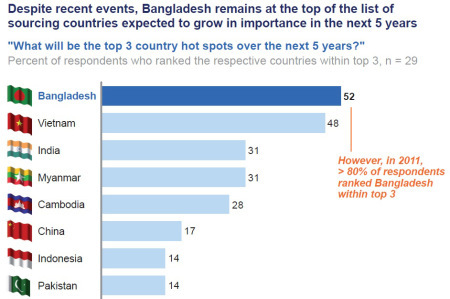 83% of surveyed CPOs plans an increase of apparel sourcing from Bangladesh in the years ahead. Overall, sourcing will continue to be one of the most critical success factors for the global apparel industry. The survey results reflect a more structural shift in the industry, while the traditional apparel company “caravan journey” becomes more complex.